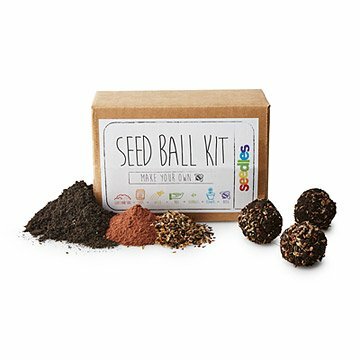 Sprout some smiles with this DIY seed ball-making kit. This DIY kit lets you make your own little botanical bombs that explode into rainbows of color when deployed in your garden. It includes organic homemade compost, native non-GMO wildflower seeds for your growing region of choice, red clay, and step-by-step instructions to form your own seed balls. A great gift for curious kids or adult guerilla gardeners, it's a smile-sprouting, interactive way to make money-saving seed starters. Handmade by Christopher Burley in California. Click here for Instructions and Frequently Asked Questions. "Nature provides an abundant source of inspiration and millions of years of experience testing things out," observes Christopher Burley. He's inspired by designing natural products that support the planet and those who live here, taking cues from “how nature would do it” and then trying to make it even better. Makes up to 75 seed balls. Choose your region for regionally specific wildflowers! This is going to be a Mother's day gift - my mom has quite the green thumb and keeps plants in abundance both indoors and out all year round. I thought it would be fun to pair with some bath bombs for another way she can relax and to tell her she's 'the bomb' ;) The packaging is very simple/plain but my only complaint really would be that I was hoping there would be some kind of card describing the plants included in the 'Midwest' (in this case) seed blend. Fun DIY for your garden! The perfect DIY for your garden, anyone can make these! A big plus for why I bought this item is that I really liked the fact that you could pick your region where you live... Living in the South, well not much grows in red clay. It was nice to actually get some flowers that will grow in our area and yes, I consider my mom and I beginners at gardening. Can't wait to make these and put these in our flower garden!